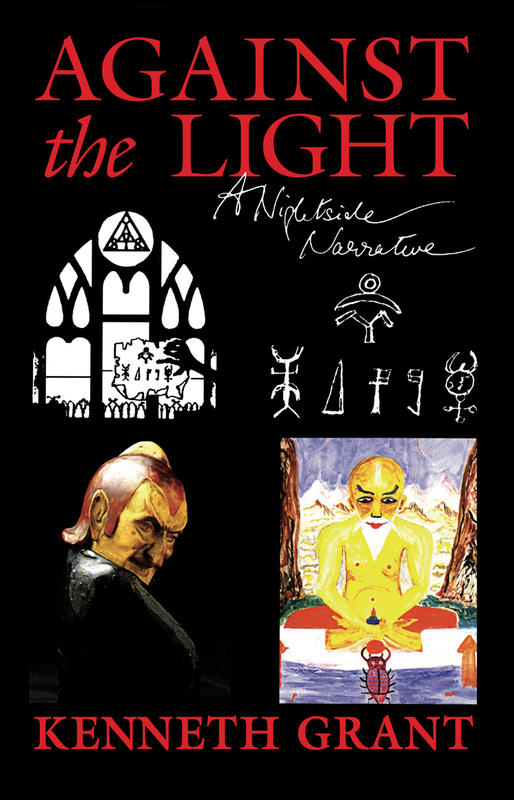 Against the Light: A Nightside Narrative by Kenneth Grant. Starfire Publishing Ltd., London, 2016. 142 pages, octavo format, sewn hardbound. With illustrated endpapers, full-colour frontispiece, and full-colour wrap-around dust-jacket designed by Steffi Grant. Limited edition of 750 copies, the first 71 copies of which form a deluxe edition. First published in 1997 and long out of print, this republication is freshly typeset, incorporating corrections and additions by Kenneth Grant noted in his copy of the first edition. Illustrated endpapers include diary entries by the author from 1985 when the novel was started; some early plot notes; the first draft of a cover blurb from 1995; and a chart where Grant gives the meaning of symbols on the front of the dust-jacket. A full-colour frontispiece reproduces the bust of Mephistopheles, a mysterious and compelling figure in this novel and elsewhere in Grant’s work. More details about the content of the book can be found here. The standard edition, ISBN 978-1-906073-37-4, is bound in black cloth and priced at £25.00. Postage and packing is an additional £4.00 within the UK, £7.00 within European countries outside the UK, and £12.00 elsewhere. For customers in Canada and the USA, the standard edition should be ordered from Holmes Publishing, our distributors there. For all customers not in Canada or the USA, payments can be made directly by Paypal to starfire.books@btinternet.com (in Sterling only) or by accessing the Paypal shopping cart buttons here. Payment can also be made (again, in Sterling only) by a cheque drawn on a UK bank, or by International Money Order or Banker’s Draft. Cheques, money orders or drafts should be made payable to ’Starfire Publishing Ltd.’ and posted to Starfire Publishing Ltd., BCM Starfire, London WC1N 3XX, United Kingdom. The deluxe edition, ISBN 978-1-906073-38-1, is limited to 71 copies. The boards are bound in a double-marbled hand-made paper, with an additional leather quarter-binding across the spine. Slip-cased, with full-colour dust-jacket, the book comes with black and white custom printed endpapers, and with top and tail bands to the binding. Each copy is hand-numbered, and signed by Steffi Grant. The price is £130.00. Postage and packing is an additional £7.00 within the UK, £15.00 within Europe, and £18.00 elsewhere. Payments can be made directly by Paypal to starfire.books@btinternet.com (in Sterling only) or by accessing the Paypal shopping cart here.